We all want to spend less money than we have to on vacation and avoid paying over the odds. Going on vacation can be an expensive time, mainly because we are at the mercy of travel agents and hotel concierges and we don’t necessarily know the cheapest places to eat and so forth. On the whole Puerto Vallarta is not a particularly expensive vacation destination especially if you are spending dollars or euros but there are some easy ways to spend less on vacation in Puerto Vallarta. The cheapest way to enjoy Puerto Vallarta is to plan your vacation in advance and enjoy the best offers. This includes cheaper flights and the best deals on Puerto Vallarta resort accommodation. When you have a clear idea of your dates for taking a vacation to Puerto Vallarta, you can start planning with plenty of time. That way you can look out for special offers and make your reservations when the lowest prices are being offered. If you are traveling to Puerto Vallarta with children under 12, you can find some great cheap all inclusive resorts that offer special deals where kids eat for free. All inclusive resorts in Puerto Vallarta can save you a lot of money if you plan right. Likewise, if you like to eat out in Puerto Vallarta, then you would be best to choose a resort with European plan or self-catering facilities such as those resorts that offer timeshare units. Bringing everything you need with you to Puerto Vallarta will also save you money. Making sure that you pack suncreams, medication and bathroom items will stop you from having to pay over the odds for those necessities in the airport or hotel stores. Packing enough clothes will also save you money on hotel laundry charges or buying new clothes. Shop around for tours and excursions. Do a little research on the kinds of excursions you wish to experience in Puerto Vallarta and compare the prices you are offered in the hotel with those of agencies in Puerto Vallarta’s downtown. You may also consider renting a car and organizing tours by yourself. If you have not chosen an all inclusive package and you are eating out in Puerto Vallarta most nights, then you can make savings by eating where the locals do. Look for taco stands where there are a lot of Mexicans or ask the hotel bell boy for recommendations. Puerto Vallarta taxis will take you to places where the driver earns a commission and are not necessarily the cheapest places, and the hotel concierge will also send you to the most popular places in Puerto Vallarta. For a truly authentic Puerto Vallarta experience, ask an unbiased local. Avoid paying for internet in hotels by visiting a cafe. Most English speaking cafés in Puerto Vallarta have free wifi service, which will save on hotel internet charges. 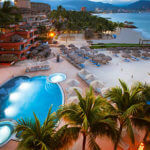 Share the post "How to Make your Vacation in Puerto Vallarta Cheaper"